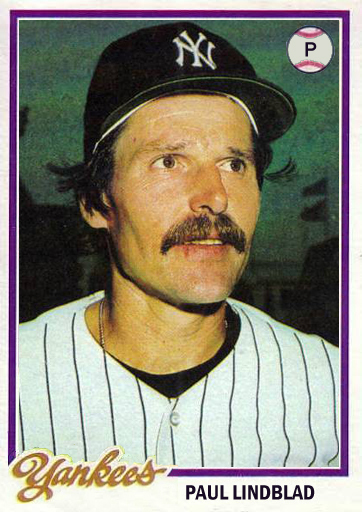 I want to remember the life of Paul Lindblad, who ended his eleven year baseball career with the New York Yankees in 1978, where he won his second World Series ring. Paul passed away nine years ago; today would have been his 74th birthday. The first time Paul and I were in the same game together was on July 16, 1966 against the Kansas City Athletics at Municipal Stadium. Paul and I were both rookies and both starting pitchers in that game. I left the game in the bottom of the fifth after Kansas City tied it up, 3-3, and Paul left the game in the top of the sixth when, after walking Ellie Howard, he gave up a Home Run to Tommy Tresh. That game was memorable because Whitey Ford pitched in relief, wound up blowing the save and getting the win. Paul got the win Game 3 of the 1973 World Series against the Mets, something that I recall making me very happy at the time. He spent two-third of his career in an A’s uniform. He was a good guy, and it was sad when he died of Alzheimer’s at such a young age. Thank you, Fritz, for the nice remembrance of Paul “Junior” Lindblad, my cousin Kathy was Paul Lindblad’s wife. It was nice of you to mention Paul’s world series victory and that you were happy for him at the time. The first major league baseball game I saw was at KC’s Municipal stadium on a Sunday afternoon in August, 1967, KC A’s vs New York Yankees. The final score was Yankees 7, A’s 5, the winning pitcher Dooley Womack, losing pitcher, Paul Lindblad. The ironic thing about this, is there was one Yankee player signing autographs next to their dugout, so I walked over there with my KC A’s scorebook to get the player’s autograph. I’ll give you one guess as to who the player was, one hint is you’re pretty close to him and his initials are F. P. Yes, Fritz Peterson was the first autograph I ever got from a major league player. Good luck to you sir, and thanks again for your nice words about Paul Lindblad, one of the finest men I’ve ever met.